June 16 is Father's Day. Second quarter 2013 estimated tax payment due June 17. California LLC fee payment due June 17. Foreign account report due June 30. Temporary expansion of employee classification program expires June 30, 2013. Attention tax professionals! Michael Gray live tax planning presentation. Loan guarantees were prohibited transactions. Participation as trustee by corporate officer disregarded for passive activity loss limit. Marin County broadcast time changes for Financial Insider Weekly. Visit our new article: The World Is Flat. 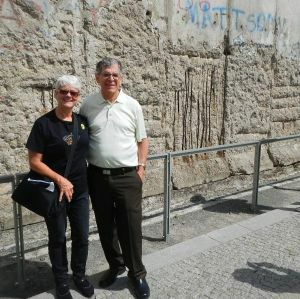 Janet and I visited part of the remains of the Berlin Wall during our Baltic cruise. Now is the time to honor and express appreciation to your father and other fathers who have contributed to your life. Remember Father's Day on Sunday, June 16. Some students have already graduated, but June is the traditional â€œgraduation monthâ€�, especially for high school seniors. For those who have graduated or will graduate this spring, congratulations. High school graduation is one of a few rites of passage to adulthood that remain in our society. Graduation is especially an accomplishment for parents, who graduates should also thank. This isn't an ending, but a beginning. Now the real work of becoming independent starts. Good luck! Second quarter 2013 estimated tax payment is due June 17. The second 2013 estimated tax payment for individuals and calendar year corporations, estates and trusts is June 17. California requires some taxpayers to make estimated tax payments electronically, generally using Web Pay at www.ftb.ca.gov. The IRS also requires that businesses make their payments electronically, generally at www.eftps.gov. Remember that California individuals who have gross income exceeding $1 million must compute their estimated tax based on current year taxable income. High income taxpayers subject to the increased federal tax rates and the new tax on net investment income and who aren't making estimated tax payments based on their 2012 income tax liability will have an especially challenging time making the computations this year, and should probably seek professional help. Even the professionals will find it difficult. The good news is the interest rates used to compute the penalties for underpayment of estimated tax are currently very low, so the penalty shouldn't be onerous if you do underpay the estimated tax. California LLC â€œfeeâ€� payment is due June 17. California assesses a â€œfeeâ€� when LLCs doing business in California have at least $250,000 of gross income. The estimated fee payment for calendar year LLCs for 2013 is made for Form 3536 online using Web Pay at www.ftb.ca.gov and is due June 17. The fee payment is â€œprotectedâ€� from penalties when it is for at least the fee amount on the last year's LLC income tax return. Foreign account report is due June 30. The annual Foreign Bank Account Report (FBAR), Form TD F 90-22.1, for 2012 is due June 30, 2013. The form is required for foreign bank and brokerage accounts either owned by a U.S. citizen or resident or over which a U.S. citizen or resident has signature authority. It also can apply to foreign financial accounts such as life insurance policies that have cash surrender values. The report is required when the total balances for the accounts equal or exceed $10,000. This is a separate report from your income tax return, and no extension of time to file is allowed. The penalties for failure to report are severe, and the IRS is on the war path about enforcing this reporting requirement, even though no tax may be involved. You can get the form at the IRS web site, www.irs.gov. Next year (2014), electronic filing will probably be required for this form. The IRS is temporarily waiving some of the requirements that used to apply to qualify for its Voluntary (employee) Classification Settlement Program. This program enables employers who have been reporting employees as independent contractors to get in compliance with payroll reporting requirements with reduced exposure to penalties. For example, previously an employer who had an income tax audit in process wasn't eligible to participate in the program. Another example is employers who didn't issue Forms 1099 to the employees weren't eligible to participate. Until June 30, they can now. Interested employers apply for the program using Form 8952, Application for Voluntary Classification Settlement Program, at least 60 days before they want to begin treating the workers as employees. For more information, see your tax advisor. Michael Gray will give a luncheon presentation to the Santa Cruz Discussion Group of the Silicon Valley, San Jose chapter of CalCPA. The title is â€œIncome tax planning in a new tax environment.â€� It will take place from noon to 1:30 p.m. on Thursday, June 13 at Michael's on Main in Soquel. The investment is $20 for CalCPA members and $25 for nonmembers. For details, see the CalCPA web site resources, www.calcpa.org, local chapters or call Stephanie Stewart at 408-983-1122. A company was owned by individual retirement accounts. The owners of the IRAs guaranteed a $200,000 promissory note to the seller of the business to the IRAs. The IRAs were converted to Roth accounts and the corporate stock resold. The Tax Court found the loan guarantees were prohibited transactions. Therefore, the IRAs became disqualified and considered distributed as of the beginning of the year of disqualification. The sale of the stock by the Roth accounts was taxable. This case illustrates the sensitivity of making alternative investments in an IRA. It should only be done with great care to avoid disqualification of the IRA and current taxation to the owner. Participation by trustee as corporate officer disregarded for passive activity loss limit. An individual was a corporate president and shareholder in two S corporations. He was also a special trustee of trusts owning stock in the S corporations. The IRS Chief Counsel ruled the participation as corporate president was in a separate capacity than as a trustee, and couldn't be attributed to the trusts. Therefore, the S corporations were passive activities of the trust, subject to the passive activity loss limitations. Starting Saturday, June 15, the broadcast time for Financial Insider Weekly will change from 1:30 p.m. to 1 p.m. in Marin County. The program is broadcast on Comcast channel 26 and AT&T U-verse channel 99.